Simple, quick and delicious. 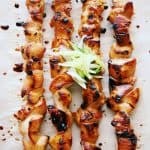 Make these 4 Ingredient Teriyaki Chicken Skewers for your next weeknight meal and you will not be disappointed. I promise! Serve with a salad, some brown rice or some simple sesame egg noodles. 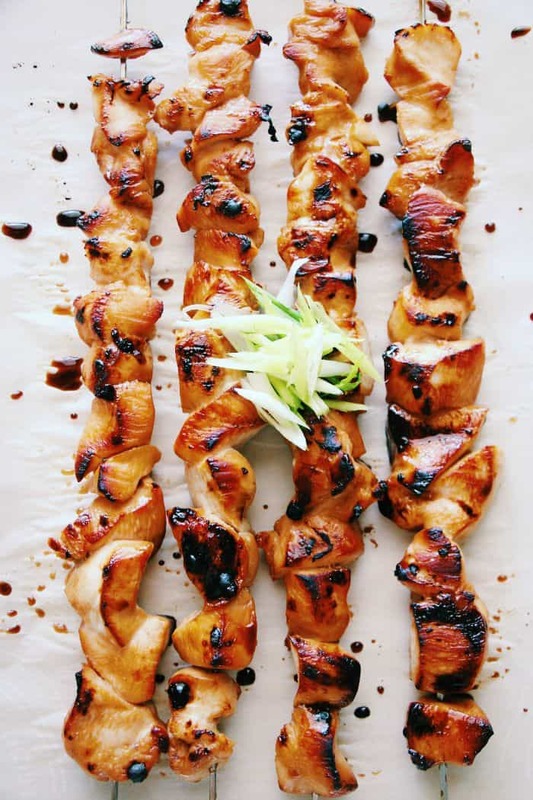 Four Ingredient Teriyaki Chicken Skewers are going to change your life. I have long been a fan of honey, soy and garlic chicken, and have made a number of variations over the years. This one though, this one is PERFECT. Even though it is probably the easiest one I have come up with. After the great response I had from my Chicken and Zucchini Skewers with Salsa Verde I thought it only right to come up with another chicken skewer recipe, more suitable for a weeknight meal. With only 4 ingredients and one dish – this one couldn’t be easier! 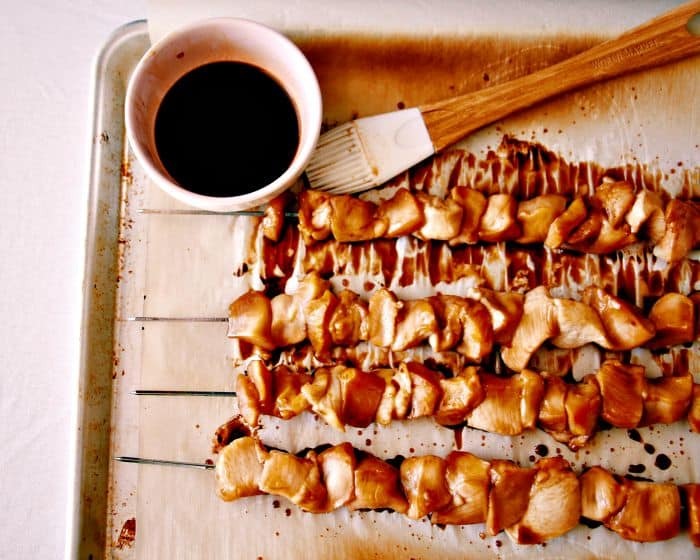 How Easy Is It To Cook 4 Ingredient Teriyaki Chicken Skewers? You can pop the chicken in the marinade in the morning, and then all you have to do is chuck it under the broiler at dinnertime. I have served it up with some Summer Stone Fruit Spinach and Strawberry Salad and 40 Minute Honey Wheat Dinner Rolls for lunch, and some simple sesame egg noodles for dinner, and they were delicious both ways! I hope you love these easy Chicken Skewers! Simple, quick and delicious. Make this for your next weeknight meal and you will not be disappointed. I promise! Serve with a salad, some brown rice or some simple sesame egg noodles. So excited that it’s getting to be grilling season so I can make awesome dishes like this! This looks so simple, yet flavorful! I love the flavors you’ve chosen here. Tamari is a favorite of mine and it goes so well with honey. I’ll have to make these! 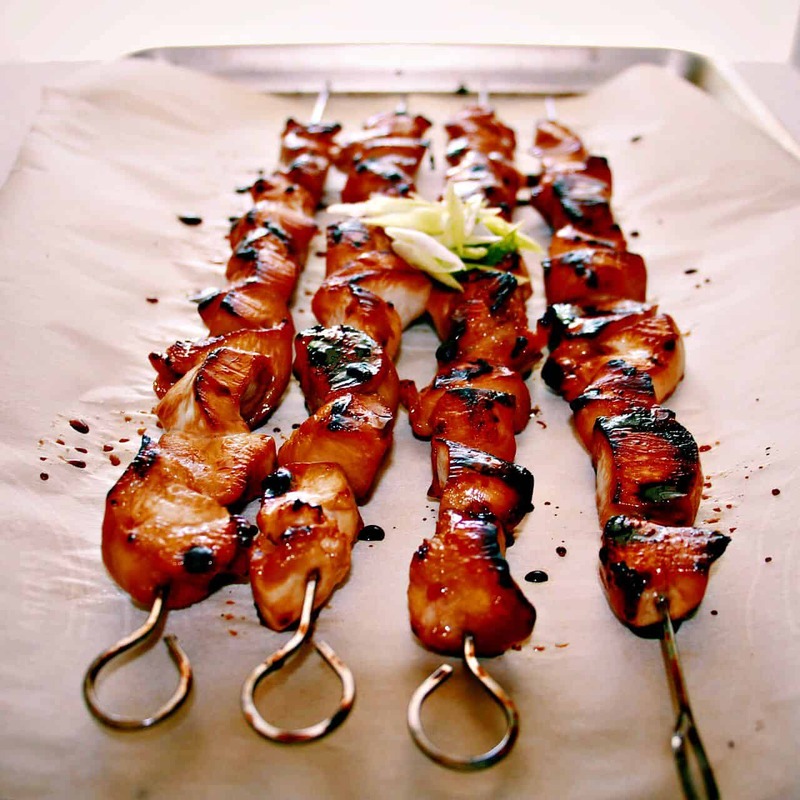 I love how these skewers are so simple, but look so mouthwatering! My favourite type of recipe 🙂 I’ll have to try these out for sure! Looks delicious! And easy! I always buy tamari instead of soy sauce, so I have everything I need to make this! 🙂 Can’t wait to try it! Sharing on my Facebook page tomorrow and sending some other foodie love your way! Thanks for sharing it with us at #FoodieFriDIY! Hope to see you again tomorrow night! These look fantastic! And I love the simple marinade!! easy, simple and delicious, I love this type of recipes, the chicken turned out delicious, I can tell! Your photos of those skewers makes me want to reach in and grab one. Perfect Summer food. These look absolutely delicious! Can’t wait to try them! I’m loving it! A great weeknight “go to”! Thanks for sharing!! This recipe looks simply delicious! What an easy marinade! Love it! 4 ingredients — you are speaking my language. 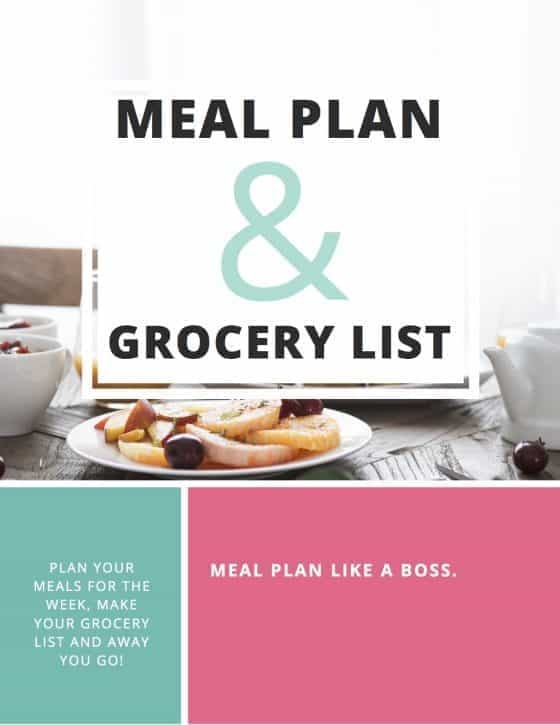 With the busy school year coming up I need as many quick and simple recipes as I can get my hands on. These look wonderful. And easy. Win! Haha, I totally used to be about fancy, intricate meals….kids came along and now the less ingredients the better! Quick, easy and yummy – my kind of recipe! We’ll definitely be trying this soon! Thanks for sharing. These chicken skewers look amazing! I’ve never tried to put honey on them before. I will definitely have to give it a try! These look delicious! And what’s not to love about a recipe with 4 ingredients? Pinning this and I can’t wait to try it. The simplicity of this dish makes it something I would actually try to accomplish haha! Sounds delicious! Looks delicious! And I love the fact that the ingredient let is so short. Something about eating off a stick is always appealing to the kids. Oh I know, my little ones love eating from a stick! Oh my goodness, these skewers look delicious! I love honey and garlic together; we just made some tacos with that combo and we LOOOOVED them! Yum, I wouldn’t have thought of that flavour combo in tacos, but I can totally see it working!! I love how easy these are! I’m adding them to my quick meal list for back to school. Definitely a handy one to have for busy school nights! The chicken looks delicious but as I am a veggie I would substitute it with quorn . This look delish and made me very hungry. Not being the best cook, I think I can even make these with 4 ingredients. Thanks for sharing. I LOVE how simple this recipe is! It really is the basic things that are often the best! Oh man, these look so delicious! My husband would love them! These look perfect! And I love your skewers– so handy to reuse them!